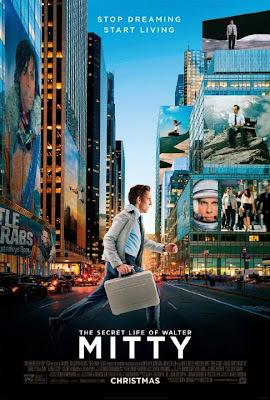 2013's Walter Mitty movie is a commentary on life, that can be taken as just an entertaining, cinematic journey or it can move you to thinking about doing more to experience and live a real life yourself. Step away from the computer, stop experiencing life through a camera phone and start being in and creating real life memories. I've never been a huge fan of Ben Stiller movies and I don't really know why. They can be a bit hit or miss with the humor, sometimes going into completely silly premises that cross some imaginary line in my brain that says "I can't believe you're watching this?". Of the Ben Stiller movies I've seen I can't say any were all bad and I think his humor is growing on me. However, it was the trailer to Walter Mitty that really hooked me in. The epic leap Walter does from the railway station platform into the building window moments before the apartment explodes in a ball of fire, racing several levels down to the door, revealing Walter's exit, having saved the life of a dog owned by a very pretty woman... and then back to reality, where Walter zones back in having missed his train. If you're not a Ben Stiller fan then this is the Ben Stiller movie for you. If you are, you don't need me to say go and see it. I totally bought into Ben as Walter Mitty, from the very beginning, where he's struggling with the idea of whether or not to send a wink on an internet dating site. For anyone who lives in their head, that kind of thing can be a big deal. It may be a slow start to the film but that really sets up how uneventful Walter's life has been to this point. Walter's journey throughout the film seems a little bit contrived as he attempts to track down a missing photograph negative, needed for the cover of the last edition of Life Magazine. However it's easy to forgive that because it's just great to see Walter having all these experiences that highlight how exhilarating real life can be. I really don't need to talk up this movie at all. All you need to know is in the trailer. It's got a great supporting cast and Adam Scott's beard should be up for a best supporting actor nomination (I've never seen a manicured beard that screams 'BEARD!!' at you before). Worth seeing in the cinema for both the special effects and the cinematography on location. This is a grown up Ben Stiller film, with some silly and childish moments that are well within the context of the overall story.